We've had good luck extending the growing season with our quick hoops. If we keep moving towards a mini Ice Age Dean Steward's cattle panel greenhouse with the cinder block basement might be a good direction to consider. Seems like it could also incorporate some additional diy geothermal energy to keep things from freezing in the Winter and maybe cooler in the peak of Summer. 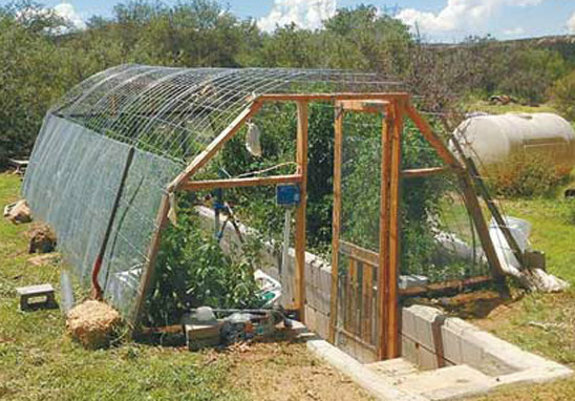 This configuration would also be good for folks who have problems bending over to reach the weeds. Given your relatively high groundwater levels, the trench might become a pool. Maybe a path at ground level with raised beds on both sides would work better at your location? I bet it would be more efficient to build the brick wall above ground, facing south, and the translucent walls built as a lean-to. With the sun low in the sky during the cool months, most of the bricks in the trenched version are in the shade the way it's pictured. I doubt if such a shallow, small trench provides much of a geo-thermal effect to provide additional heat inside that structure. My simple hoop house (no digging & no brick work) allows me to keep harvesting greens, radishes & tomatoes well into November, located 42*N.
Water is a better thermal mass. The heat capacity of water is around 4 J·g⁻¹·K⁻¹. Concrete is only 0.88 J·g⁻¹·K⁻¹. So a kg of water can store 4x the amount of heat of a kg of concrete. Even if you factor in the density (1 g/cm³ for water, 2.4 g/cm³ for concrete), the heat capacity of water is 4 J·cm⁻³·K⁻¹ against 2.1 J·cm⁻³·K⁻¹ for concrete. So a volume of water can store twice the amount of energy of the same volume of concrete. We actively pursued this option in southern Indiana. The water table is too high and aside from a lot of water in our holes, we got a lot of mold. I advise against the underground version in places with high water tables. A version backed into a hill might work well, if you have good drainage around the back and sides.